Astronaut Clayton Anderson, STS-131 mission specialist, tries on his spacesuit before the April flight of the shuttle Discovery. 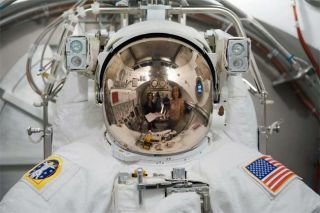 Astronaut Dorothy Metcalf-Lindenburger, mission specialist; along with technicians assisting Anderson, are visible in the reflection in his helmet visor. Two space shuttle astronauts will exit the InternationalSpace Station early Friday to complete the first of three spacewalks plannedfor their mission. The spaceflyers plan to prepare a giant tankof ammonia, used for coolant on the space station, to be installed on thebackbone-like truss of the orbiting lab. STS-131 mission specialists Rick Mastracchio and ClaytonAnderson will step out of the spacecraft at 1:41 a.m. EDT (0541 GMT) to begin asix-and-a-half-hour excursion. Both men are spacewalking veterans, and have even conductedprevious spacewalks together during the August 2007 STS-118 mission to thestation. "I'm looking forward to getting out the door again withClay. He's great to work with," Mastracchio said in a preflight interview. Mastracchio, the mission's lead sapcewalker, will wear aspacesuit marked with red stripes, while Anderson will wear an all-whitespacesuit, to help distinguish them to officers in Mission Control. "My number one job is to just make sure that we havesafe and successful spacewalks," Mastracchio said. The new ammonia tank was carried up to space by the shuttleDiscovery when it launchedApril 5. The hardware will replace a spent tank that will be returned toEarth at the end of the orbiter's 13-daymission. "It's probably the size of a doublerefrigerator-freezer component and it lives on the backside toward the centerof the station," Anderson described in a NASA interview. To prepare the old tank to be removed, the spacewalkers willdisconnect some cables and reconfigure bolts. They will also go to the spaceshuttle's cargo bay, where the new tank is waiting, and prepare that to bereleased. Once that is done, pilot James Dutton and mission specialistStephanie Wilson will work from inside the station to grab the tank with the station's58-foot (18-meter)-long robotic arm to maneuver the hardware into a temporarystoring place. After their work with the ammonia tank, the spacewalkers willretrieve a science experiment that had been running on the outside platform ofthe JapaneseKibo laboratory. The project was testing the effects of the space environmenton various materials. Finally, the astronauts plan to remove an old piece ofhardware called a rate gyro assembly from the outside of the space station, andreplace it with a new one. NASA had also aimed to have the astronauts prepare somesolar array batteries for removal, but mission managers pulled that task fromthe schedule to avoid a potential electric shock hazard for the astronauts.